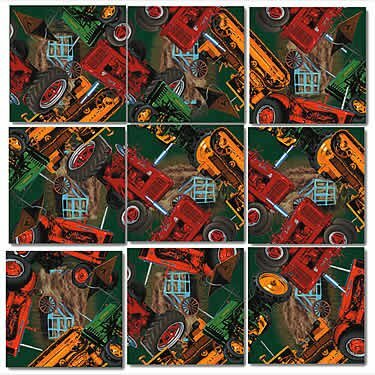 Tractors have revolutionized the way farming is done, enabling the production of vast amounts of food with increasingly less labor, feeding the world and helping to make possible the technological revolution of the 20th century. The roots of farming began about 10,000 years ago in the area that is known today as Turkey and in the Middle East . Two of the earliest known farming settlements were Catal Hüyük and Jericho. By 6000 BC, Catal Hüyük had more than 1,000 dwellings and it is where archeologists have found first evidence of people using seeds from wild grasses for food and for planting new crops for the following year. Such grass seeds are now commonly known as cereals and make up a large percentage of the world’s food supply. Not until man began to plant and harvest crops did early human hunter-gatherers begin to form large permanent settlements, which became civilization’s first cities. Jericho, like many early cities, was located at a fresh water spring which produced over 1,000 gallons of water every minute. Jericho’s early population of 2,000-3,000 supported themselves by farming wheat, barley, peas and lentils. Farming changed very little from its origins until about 1700, when an agriculture revolution occurred which led to a large increase in the production of crops, including crops from the "new world," such as corn and potatoes that produce very large yields. In the 1850s, the industrial revolution advanced farming with new mechanized farm implements, greatly increasing farm production rates. Most of these early implements were still powered by horse or oxen. The advent of steam power and later gas powered engines brought a vast new dimension to the production of crops. Early tractors utilized wide metal tires to disperse their weight in the soil. Front wheels often had ridges for helping to steer through the farm soil. Tractor traction problems resulted in engineers innovating a continuous belt with slats fitted to the front and back wheels that pulled the tractor through the soil. This traction technique has been made famous by Caterpillar company and is still popular for heavy earth moving equipment today. Allis-Chalmers' history as a manufacturer began in the 1840s in Milwaukee, Wisconsin in the United States. In 1914, the growing company entered the farm equipment business and became the innovator of many advances in farm equipment and one of the largest and most diverse manufacturers in North America. In 1985, Allis-Chalmers sold its farm equipment division to K-H-Deutz AG of Germany. John Deere’s two-cylinder tractor engines use a "180-degree crank.” When one piston is up, the other is down, and the inertia of one piston moving up is offset by the inertia of the other piston moving down, balancing the engine and keeping the volume of air in the crankcase beneath the pistons essentially constant, causing the Deere engine to make its trademark "popping” rhythm. The International Harvester Farmall M was one of farming history’s most successful tractors and one of the few tractors of the 1940s with the power, capability, styling, and popularity to become a lasting symbol of modern farming. Many of the approximately 300,000 of these durable tractors built by International Harvester can still be found at the beginning of the 21st Century, and a restored Farmall M might sell at auction for $3,000-$4,000, especially if it's a Super M-TA or Super MD-TA model of this famous tractor.